Cette phénoménale Location de vacances de 2 étages a tout-emplacement central en bord de mer avec 3 chambres spacieuses et 3 salles de bains tous magnifiquement conçues et décorées! Parfait pour la famille ou les grands partis voyageant ensemble! Une vue imprenable sur la mer des Caraïbes à partir de l'instant où vous passez la porte. cuisine moderne et entièrement équipée avec comptoirs en granit et tous les appareils. Profitez des vues magnifiques de l'eau de la salle à manger et salon. Ce condo dispose d'un bar séparé incroyable la salle de séjour avec placards de granit au sommet, 3 tabourets, et un système massif de son SONY! Profitez de bronzage sur votre terrasse privée tandis agréables brises de mer flottent, ou salon dans le spacieux et aéré mezzanine à l'étage. Tous les 3 chambres comprennent salle de bains attenante avec douche à effet pluie. Meilleurs chambres loft de niveau offrent une vue magnifique sur la mer, son / le sien de plain-pied dans l'espace de rangement; avec salle de bains principale avec plein baignoire à jets. Ce condo est le joyau de la couronne du complexe El Faro. Les installations comprennent une piscine à débordement, la massothérapie, la gastronomie, espace commun Wi-Fi et un parking souterrain (Extra de stationnement payant - 15 USD par nuit). À distance de marche de tous vos magasins et restaurants préférés à Playa del Carmen! Excelente lugar, el departamento muy cómodo y amplio, la vista al mar fue increíble, la ubicación perfecta para desplazarse a a cualquier lugar, 100% recomendable. Muchas gracias por tus comentarios!! Coral 303 es un condo inigualable!! Super amplio y con una de las mejores vistas del complejo. Nos complace mucho saber que tuvieron una excelente estancia y esperamos se queden con nosotros en un futuro, recuerden que siempre podemos ofrecer un descuento a nuestros clientes repetitivos!! Thank you so much for your comments!! Your feedback is very important to us. 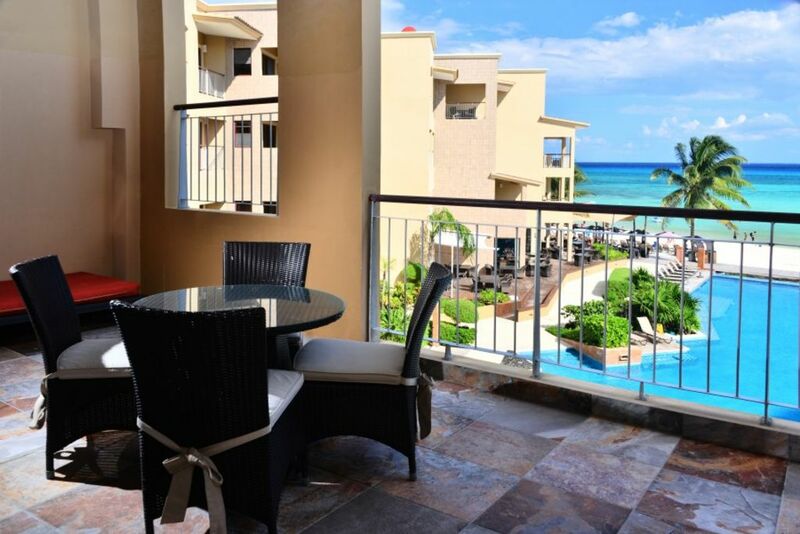 Coral 303 is by far one of the best condos at El Faro. View are stunning, lots of space, great for big families and groups!! The location is unbeatable, right on the beach and close to everything. Love everything about El Faro. Location. Pool. Beach. It's lively yet chill. The desk people were great. Housekeeping so nice. Security guards are so kind. I stayed a month and had a great time discovering Playa. Pepe the cab driver is a gem. Thank you so much for your comments. El faro Coral 303 is such a great unit. Amazing views, lots of space. The complex has the best location. Hope you can come again in the future. An amazing condo with fantastic views to the beach. Facilities were excellent, very well maintained and the location is great - all you need in Playa is on your doorstep. We have stayed in El Faro three times now and it really is a great complex. The only problem was that we arrived in the evening after the reception had closed and there was a long delay in getting our key as this particular condo requires an actual key rather than a key card and this had not been explained to the security staff. Also the overhead showers in the condo do not work. But this did not detract from an another wonderful stay in Playa - we will definitely be back! I'm glad you enjoyed your stay at Coral 303, it is huge condo perfect for big families and friends. Location is perfect and unbeatable! I'm very sorry you had some issues at the check in, we have talked to the lobby and they had accepted their mistake regarding the lack of information and communication on their side. However they are very helpful and they always try to do their best for our clients. Regarding the showers, I will pass this information to the Maintenance Staff so they can take a look and fix them if necessary. Please do not hesitate to contact us for a future stay!! The condo is the best location you could ever ask for. The view is unparalleled and although we loved just being on the beach and in the pool, there were all sorts of activities and of course 5th Ave. just a block away. Teens loved the Starbucks on the corner AND the parasailing AND the jet skiing and adults had more than one massaage right there on the property, on the beach with the waves and breezes rolling in. HEAVEN. The condo itself is laid out perfectly for a family vacation and I couldn't have done it better myself ! Individual temp controls on the A/C for each room, an adequate kitchen for home dinners AND a grocery store within walking distance !! I am so grateful to these owners for making this place available for us to use AND Sarai, Alejandra, at Rentals Your way were great as well as Isaac at the front desk. Couldn't ask for more. I am glad you enjoyed your time here. It was great working with you. Please let us know when you'll be back as we always have return customer discounts available!! !